PedestalPod 45° models conveniently position displays 20" off the deck, located near the bow and at a 45° angle for ease of viewing while fishing. This allows anglers to easily reach and access the fishfinder/chartplotter for changes to range, zoom, or even to control the trolling motor. Designed to resist impacts, vibration and moisture ingress, 45° PedestalPods are crafted with a thick gauge, UV-stable acrylic-capped ABS material and are built specifically with structural rigidity in mind. Built on the proven technology of NavPod's popular range of PowerPods, 45° PedestalPods are also manufactured with a double gasket system that provides an excellent watertight seal to keep spray off electrical connections, ensuring the reliability and longevity of marine electronics. Displays are easily installed in the pre-cut face of the NavPod. The heavy duty, powder coated aluminum pedestal tube is 3" in diameter with a 5" round base and has a large 1.75" opening, providing plenty of room for running and concealing wires internally for a very clean look. PedestalPod 45° models give protection for wires and connectors from water intrusion, UV exposure or damage from snagging and ripping connectors out of their sockets. Pre-cut models are available for 7" to 12" displays from all major marine electronics manufacturers. PedestalPods are better than bracket mounting. Very sturdy and secure, yet clean and attractive, this mount provides protection of your fishfinder/chartplotter from the harshest of wet boating conditions. 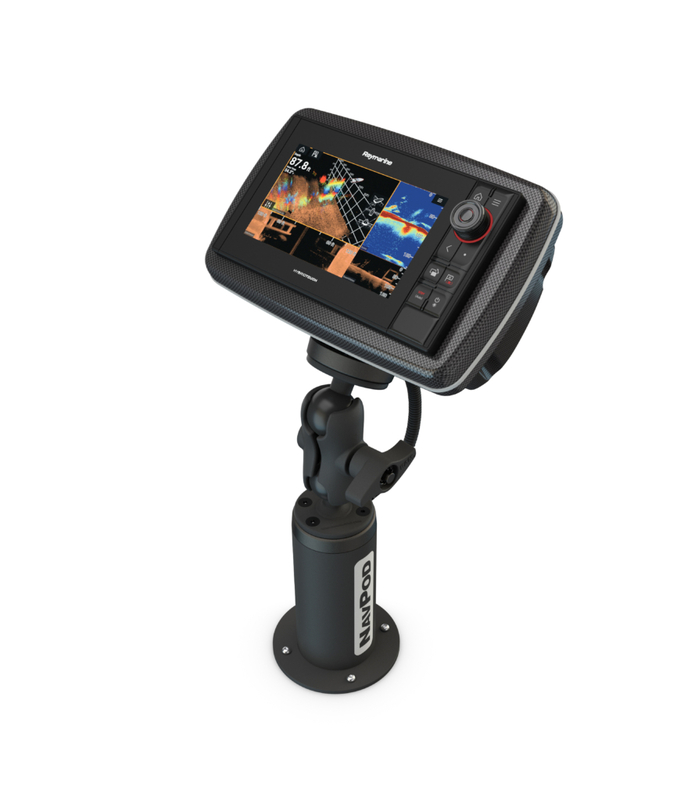 PedestalPods provide the convenience of easily reaching and controlling the fishfinder/chartplotter while providing added security with protection from theft. PedestalPods position your fishfinder/chartplotter at 17” off the deck and located near the bow and at a 70-degree angle for ease of viewing while fishing. This allows the user to easily reach and access the fishfinder/chartplotter for changes to range, zoom, or even to control the trolling motor. PedestalPods are manufactured with a double gasket system that provides an excellent watertight seal keeping spray off the electrical connections on the back of your fishfinder/chartplotter assuring reliability and longevity of your marine electronics. 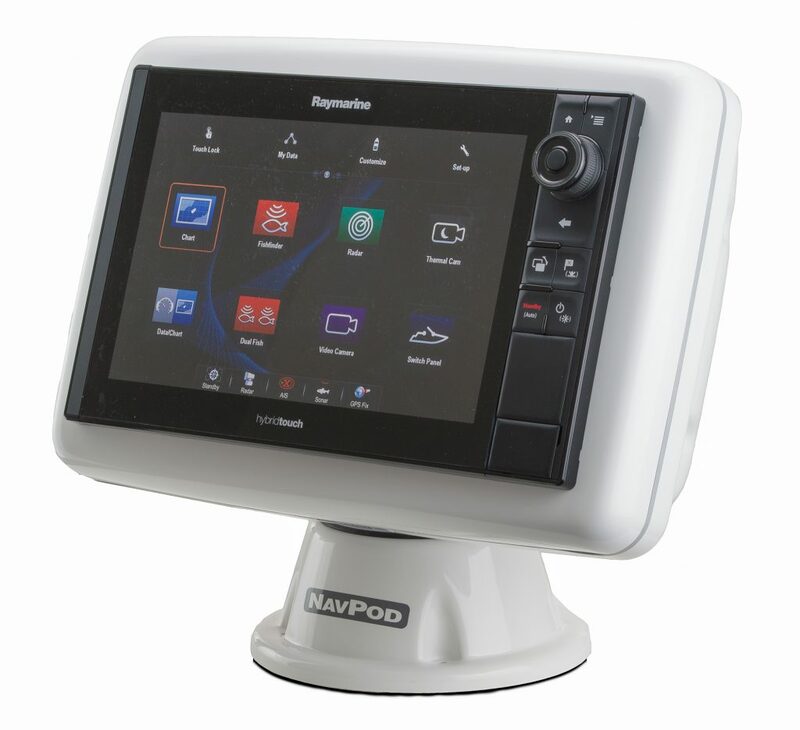 Your fishfinder/chartplotter is easily flush mounted into the pre-cut face of the NavPod. The heavy duty, powder coated aluminum pedestal tube is 4” in diameter with a 6.5” round base and has a large 1.75” opening providing plenty of room for running wires and connectors internally for a very clean look and provides protection for wires and electrical connectors from water intrusion, UV exposure or damage from just getting kicked or snagged and ripped out of their sockets. NavPods come with a security wrench and nickel chrome-plated stainless steel tamperproof screws for protection from theft. Pre-cut models are available for 15" and 16” LCD displays from all major marine electronic manufacturers. PedestalPod with RAM Mounts is specifically designed for mounting the fishfinder near the bow on Bass Boats. Built on the foundation of NavPods popular range of waterproof housings for marine electronics, PedestalPods position your fishfinder/chartplotter at an easy to reach 20” off the deck. 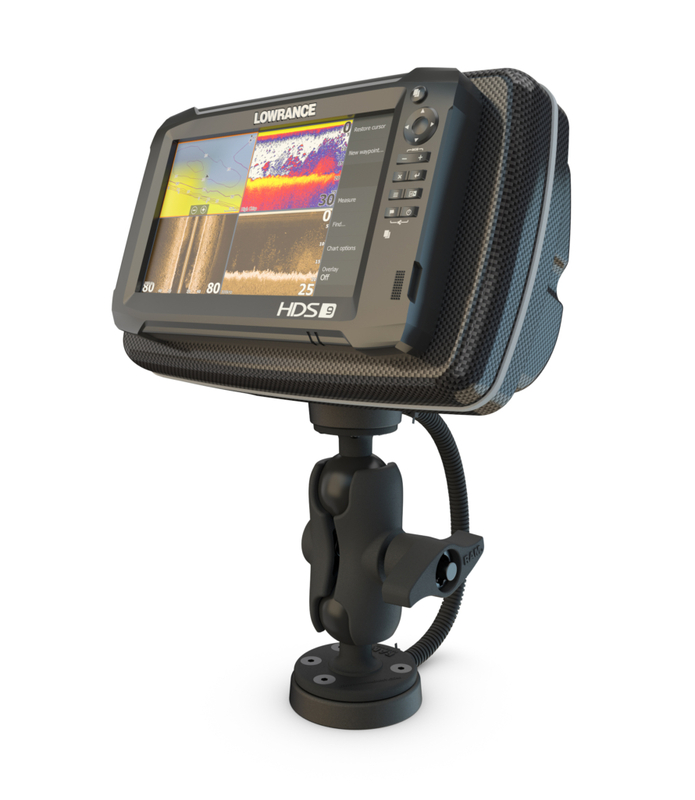 This allows the user easy access to the display for changes to range, zoom or even control the trolling motor. There is a big difference between reaching down to a height off the deck of 20” to control your fishfinder compared to reaching all the way down to the deck when it was only bracket mounted. PedestalPods are manufactured with a double gasket system that provides an excellent watertight seal. This offers protection of your fishfinder/chartplotter from the harshest of wet boating conditions. 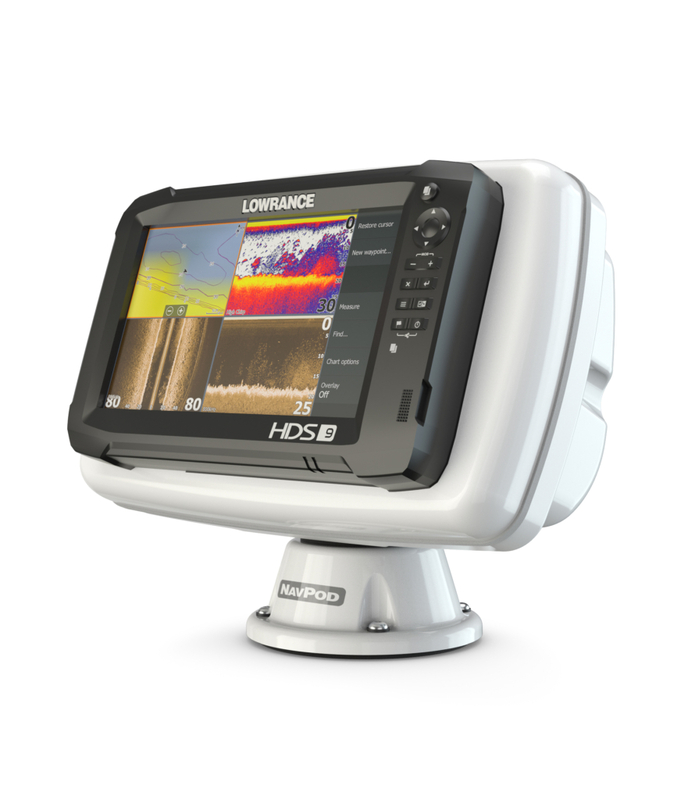 This protection assures reliability and longevity of your marine electronics. PedestalPod with RAM Mounts utilizes the proven RAM Mounting system with the large 2.25” rubber “D” size ball and the RAM pin-lock security solution. RAM Mounts are designed with a patented rubber ball and socket system that allows an almost infinite amount of ways to position the angle of the fishfinder for that precise position of viewing. When you might be trailering, or storing the boat, the display can fold flat onto the deck with only 10” of clearance. This will allow most boat covers to fit over the PedestalPod when not in use. 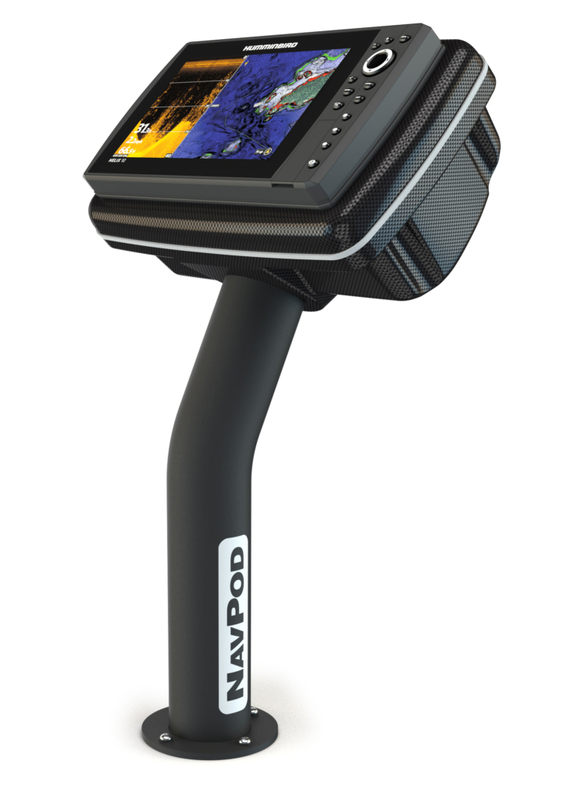 Your fishfinder is easily flush mounted into the pre-cut face of the NavPod. There are pre-cut models available for 7”, 9” and 12” LCD displays from all major marine electronic manufacturers.